Call it insurance for your Mac: MacScan 2.7 scans your hard drive for spyware, Trojan horses, keyloggers, scareware and remote administration programs that may trip up your system. It can also be set to automatically clean up after your Web browsing binges, deleting blacklisted cookies, history, temporary cache files and downloaded files lists. The interface is clean and simple, and the manual clearly explains why you might want to use the various options. MacScan is quite flexible. It lets you set up automated scans, which is good since full scans can take quite a bit time. You can also opt to scan only a specific folder and you can set it to scan only certain Web browsers such as Safari or FireFox. You can opt to have it clean up browser detritus, or not. And once MacScan detects spyware or blacklisted cookies it lets you decide whether to delete them or not. It’s really up to you just how much security you want to invoke. 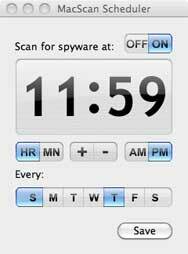 A handy status screen tells you the date and time of the last spyware scan, the number of spyware components detected on the last scan, the total number of spyware scans that have been run and the overall number of spyware components detected. The program comes set to detect current spyware but the company publishes free, downloadable definitions on its website as new spyware surfaces. MacScan can automatically check for these definitions and then let you download them. 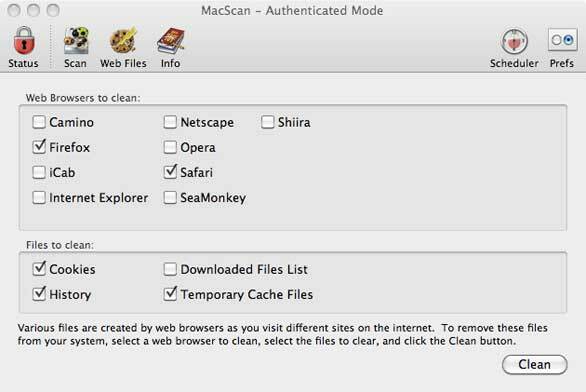 But while MacScan offers many options for how and what you want to scan, it doesn’t go all-out by offering to catch viruses. It only cares about spyware. And there is a nagging question about just how much value there is in that—unlike PCs, Macs are rarely hit with malware. And while the program’s ability to automatically clean up cookies, history and temporary files in your Web browser is nice, it’s also a little redundant since most browsers allow you to configure them to delete these files. MacScan might be best suited for the needs of schools, businesses or families that share a Mac. An administrator could quickly and easily set up the program to automatically clean up Macs that are at greater risk. Indeed, SecureMac sells the program in a less-expensive three pack just for those situations. And the program includes an “authenticated” mode that requires you to enter a username and password to run a manual scan or change the scanning options.